Please note that the content of this book primarily consists of articles available from Wikipedia or other free sources online. 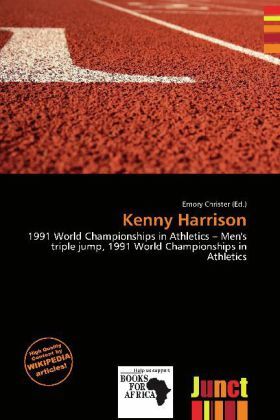 Kenny Harrison (born Kerry Harrison, February 13, 1965 in Milwaukee, Wisconsin, United States) is a former track and field athlete competing in triple jump. The 1991 World triple jump Champion, his chances of competing in the 1992 Olympics were ruined when he tore the cartilage in his knee. After recovering from surgery, Harrison bounded back to win the gold medal at the 1996 Summer Olympics with a personal best, American and Olympic record of 18.09 m. This jump is notable for the fact that it is the longest jump ever with a negative wind reading (the athlete with the next best is Jonathan Edwards with 17.79 meters).